Once people get into the search result page, there is no way to go back to the previous page without clicking the browser back button. We can add some code to a content editor web part to display a button on the page to let people go back to previous page and with search term displaying in the search box. Clicked on the demo link in the article and “View Source”ed it. All the code are laid out nicely. On the SharePoint page where I need this carousel, add a content editor web part, click on “Edit Web Part”. 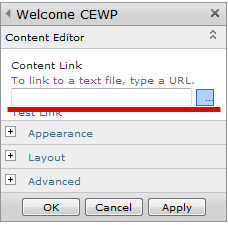 In the content link box, paste the url of the text file I uploaded to SharePoint before. Here’s the code I used, unfortunately wordpress doesn’t let me upload text files, so I had to copy and paste it to a Word document. For content editors, we can choose a markup style for the ribbon to format the text.